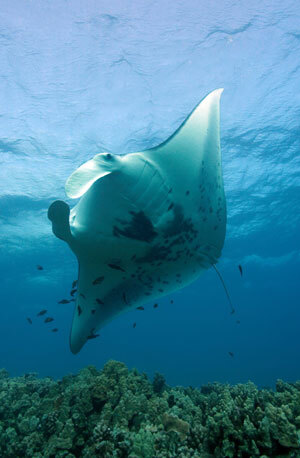 Mantas Rays are close relatives of sharks and they can be found in temperate, subtropical and tropical waters. Manta Ray Information. Facts about Manta Rays, Habitat, Feeding, Anatomy, Evolution, Predators. Most of the human contact with manta rays is usually through experienced divers. Manta rays are the fish with the largest brains, and at the same time, they are charismatic and gentle animals. Can you differentiate manta rays from their relatives, rays from genus Mobula? If your answer is no, maybe it’s time to dive into the exciting world of manta rays. The first thing you need to know about manta rays is that they’re fish just like salmon and trout, despite being different from them in a matter of appearance. In fact, they are related to sharks because both belong to the Elasmobranchii subclass and are characterized by a skeleton made of cartilage instead of bone. 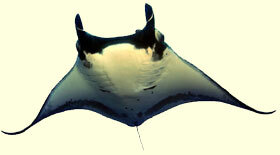 At the same time, manta rays are included in the Batoidea superorder, which includes rays, electric rays and sawfish. Most of these fish are easily identifiable by a flattened body and habit of staying near the ocean floor. Very often, manta rays are confused with any of their relatives, but you need to know that there are only two species of manta ray grouped in the genus Manta: the reef manta ray (Manta alfredi) and the giant manta ray (Manta birostris). They are large creatures that exceed 3 meters wide. Rays belonging to the genus Mobula are significantly small. The measure of the giant manta ray has reached up to 9 meters, so just imagine! But there’s nothing to worry about. Manta rays are quiet and peaceful beings that pose no danger to humans. They are devoid of the poisonous sting that many of their relatives do have, and have shown a curious behavior at the approach of humans. Many professional divers and ordinary people have been dazzled by the beauty of their swim, recognized by the pectoral fins up and down elegantly. It is not hard to see why some call manta rays “sea birds”. Manta Rays can be up to 25 feet in length and weight as much as 5,000 pounds. Manta rays can travel alone or in groups of up to 50 members. Another distinguishing feature is the presence of structures that protrude from their head, called cephalic lobes. When navigating, the manta ray keeps these lobes coiled up, but when feeding it stretches them for these to push food-rich water into its mouth. There are only two species of manta ray grouped in the genus Manta. Their huge size might suggest they need to consume large animals to satisfy their appetite. But hey, their food is smaller than you think. They eat tiny organisms, often microscopic, called plankton, which the manta ray consumes through filtering. For this purpose, it has within its gills some structures called gill rakers, which are widely sought-after in the market since they are used as remedies in traditional Chinese medicine. According to this, the gill rakers have the ability to heal from a simple cold to cancer. But before you run for your choice, keep in mind that there’s no scientific validity up to date and in turn this contributes to reducing manta ray populations. The truth is that these animals face a difficult situation being listed as vulnerable species whose population has a tendency to decrease due to fishing, habitat degradation and the effects of global warming situation. It does not help that some people still think they are dangerous animals. Manta rays are wonderful and important animals for wildlife. As people learn more about them, they can become aware about their situation and support conservation efforts.